stacey yacula studio: a charming winter stamp giveaway! 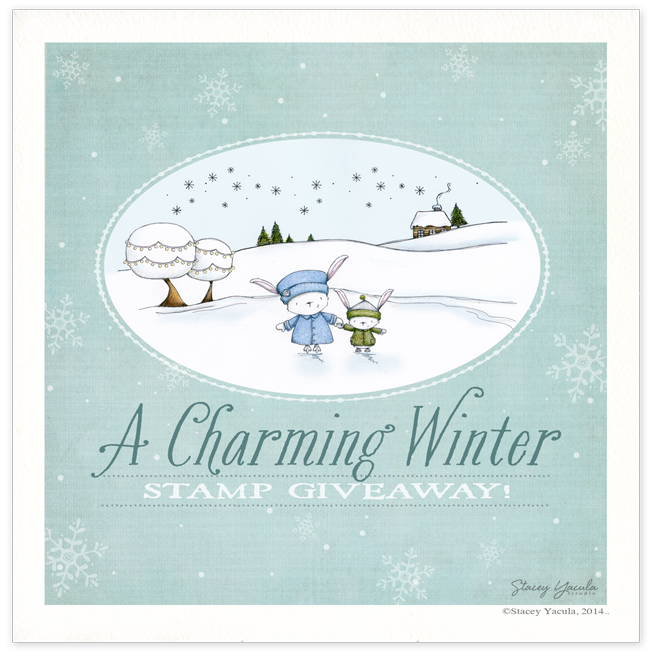 a charming winter stamp giveaway! my new winter stamp collection has arrived! and then warming up with a cup of hot chocolate. where you can visit Purple Onion Designs to view the whole collection. the entire "a charming winter!" collection. here is how you could win! ON THIS WEBSITE FOR EACH ENTRY. October 26th, 2014 at midnight EST. OMG,what a lovely dreamy winter story tells this adorable picture! You´re one of my favorite artists and I love your stamps,they´re awesome! Good Morning! I adore your characters and would like to enter the drawing for the winter stamp collection! I commented on facebook and shared your post! I visited your etsy shop and choose my fav.image/card/picture.It´s the sweet penguin sitting on a tree. A lovely winter scene,awesome and so gorgeous coloredand created,wow! Stacy I am a huge fan of all your work!!! I have bought a lot of the stamps and have had many compliments on your images!!!! I totally adore the little snowman sculptors you do!!!! And your calendars are perfect too. You have such a way of capturing the adorable little faces....and the cute scarfs and mitts you place on the image......PERFECTION! I don't have facebook or twitter so I am hoping that is ok! But in any event.. I have you on my favourite blogs I visit on my blog so that if you have a new release I can see it right away. I am looking forward to your winter release!!!! I commented and shared tow of your post on facebook. I'm not sure I can pick just one, I really live them all. But, I really like the adventure you can feel in "Wherever the wind takes me"
Picking a favorite image is so hard! It's either Finding You or Love Grows. i don't see my first comment here and wondered if i did it right so apologize if i am doubling up :) picking a fave is tough!!! but Berry is gonna have to take this one because he is my original fave ;) and just because i absolutely adore your sculptures i have to include them! #8 with his bashful look and little charm he is holding is perfection! AND the snowman holding his arms out waiting for a hug is beyond fave worthy! thank you for the chance to win a set of your stamps!!! so looking forward to seeing the collection! I love Snowman No. 9 with his little blue scarf! So, so hard to pick just one, you are my favorite artist! Whenever I use one of your stamps on a card I get so many compliments. Love your work. My favorite is Birch but then again Juniper holds a special spot in my heart! Thanks for the chance to win. I really love Hot Chocolately days in your etsy store....sooo cute! I liked Joy Ridel in your etsy shop. I adore the sending my very best wishes... It's so sweet and magical! Stacey, your illustrations are so adorable it's hard to choose just one as a favourite! I love nature so I'm especially fond of your wildlife critters, such as the cardinal, owl, squirrel, and beaver, to name just a few. Living on Canada's west coast, I love your whale illustration also. I would be excited to some otters and moose - they would no doubt be super cute! Seasonally speaking, your winter wildlife illustrations are my favourite, which is why I'm entering the stamp giveaway for the first time - thanks so much for the opportunity to win your new collection!!! Currently my favorite image of your sculptures is 2014 Snowman No.4. He is sooooo cute! Uh oh, I just saw your "Flower Parade" illustration and as I ♥ turtles this one is my fave - followed by your 2014 Snowman No. 4 sculpture. Sooo cute! Can't wait to see the new winter collection! Gorgeous work Stacey, I enjoy your images so much. Thanks a lot! Oh my goodness, I just love your sweet, adorable illustrations! Hard to pick a favorite but since it's almost Halloween I am loving A touching Tale! Sweet mice and that pumpkin is so whimsical! I love all of the prints on your Etsy site and my two girls are oohing and ahhing over them right at this moment! The one that grabs my heart is Christmas Love because it reminds me of my 1 year old! LOL! I love the "Just You and Me" I saw on Esty. Love the tress surrounding them. I didn't order that on my last order as I just recently discovered your stamps. Love the images and the quality of the stamps. Needless to say I will be ordering more. The hardest part is deciding what to buy on that order. Trying to decide which is my favorite is no easy task as all our your critter images are so adorable! I think I like the Finding You image the best as not only are the critters darling but I love your floral design as well. I just love all your snowmen sculptures but Jolly just took my heart! I am very excited to see the new release. I always love your work. Snowy Greeting is absolutely adorable! So pleased to see new designs for the winter... yay! Love all your designs, and am so partial to your snowmen! I just recently purchased some of you stamps through Purple Onion Designs, they are all so adorable! If I have to pick just one I think it would be Blossom, love that sweet bird. Your work is amazing! So glad I stumbled upon it! My favorite is the Beautiful Day series. The critters are the cutest ever and I adore the way you illustrate trees. So excited for this new release! My favourite illustration is Happy Go Lucky. It makes me smile every time I look at it. Thanks for the chance to win!! I like the Owl by moonlight illustration. I like the Dare to Dream sculpture. Wow are your prints adorable! I love all those sweet little creatures so much but if I have to pick a favorite it would be Glow (at least for today!). I love all your sculptures and illustrations, they bring warmth and sunny thoughts every time I see them! I wish I could get some here in Finland, too. My favorite is illustration called Shine bright, he simply melts my heart. Hi Stacey, it´s hard work to choose my favourite image. But Twinkle and Juniper are the cutiest. Thanks for the chance to win the new collection. Love the 2 Forests and Beautiful day sentiment Such sweet designs! Love the card! Thnak you for the chance to win! I have lots of favorites! I just got Rosie and I'm loving her!! I also love Tucker and Shadow! Oh My Gosh, I absolutley love all of your darling images..
especially the snowmen.. this one is so adorable " Snowy Greeting"
I'm so looking forward to the new images. I love your designs in their rubber stamp form and your design skills are amazing. I particularly love your sculptures, I think Lili the bunny and Snowflake (I LOOOOOOOVE penguins) are my faves, but they're all so cute it's hard to choose. I saw your tea-towels too a few days ago and they're gorgeous (far too nice to use but great as a gift, although I always feel embarrassed giving tea-towels as a gift, I feel like I'm saying to that person that their kitchen needs a tidy up!!! ;0) I'm so excited about the new images. Honestly, I love all of your illustrations. But Sweet Gatherings (birds on tree) really speaks to me. But they're all beautiful! Hello, love all your designs. My favorite all-time is Wishes (blowing dandelions) and I posted a card on my blog earlier this year. In your etsy shop, I found Warmest Wish ( Santa and bluebird) which is adorable. I love all your illustrations and stamps. The penguin is the one I love the best, especially your Little Loves illustration. I hope your new stamp collection will have another penguin in it! I don't know how to post a link from Facebook or Twitter so I just did both. Hopefully you'll see my notifications. Thanks Stacey for the chance to win your cute stamps. I love your work, but if I had to choose one I'd take Finding you! Can't wait to see your newest stamp collection. Hi I just discovered you and WOW ! I'm in love with Blossom!! SOOOOOOO CUTE!!!!!! Love love love the details. I think any stamp with one of your adorable bunnies would be a favourite. That said, I love all of your sweet images! As I love all your stamps it's quite difficult to say which one I like most. But as I love winter and snowmen, I think my favourite image is the snowman "Berry". He has just such a big smile on his face that I always have to smile when I use that stamp. My favorite is Love Grows :-) Thx for the chance. I Love all your images....but Star an Sky are so sweet.